Common Holly in store concert + Turkish Café / Penombra Sessions a partire dalle 19.25. Folk vibes splashed with indie-rock and a constant seam of dreamy pop is what makes Common Holly so special to us. The Montreal-based singer and songwiter struck us as a lightening with her simplicity, her sound and her painfully gracious autopsy of a a heart. That’s what ‘Playing house’ her debut album (Solitaire Recordings, 2017) is all about. Their destiny was written on the coffee grounds at the bottom of a cup, somewhere in Turkey. The old fortune teller spoke about rhythm, acoustic instruments, warm pounding hearts, electronic detours and cultures that melt into one another. So Turkish Café was born exactly 10 years ago, bringing their music across Europe, first in the streets and then on many many stages, opening concerts for names of the caliber of Niccolò Fabi, Marlene Kuntz, Rachele Bastreghi – Baustelle, amongst others. Two bands that couldn’t be more different, 360° of music, it’s basically nouvelle cuisine transposed into a live music experience; why stick to similarities when we can enhance the beauty of diversity? 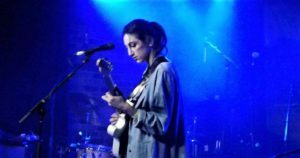 We are very happy to continue on this path we started with Maria Taylor’s concert, last February: extemporary performances from other planets than ours. Rock, folk, electro, shoegaze, experimental, we open our doors for musicians from all over the world. We’d like to share this new concept with you and have you over for our second Penombra Session; free entrance, as usual!